Balmain Pen Set South Africa- A stunning gift set from the sophisticated Balmain range, the Arles Ball Pen and Rollerball Set is a sleek client gift that they will love to use day after day. A great branded gifting item that is perfect for any corporate or professional environment, these beautifully crafted pens can be elegantly engraved or printed on for an executive look and feel. 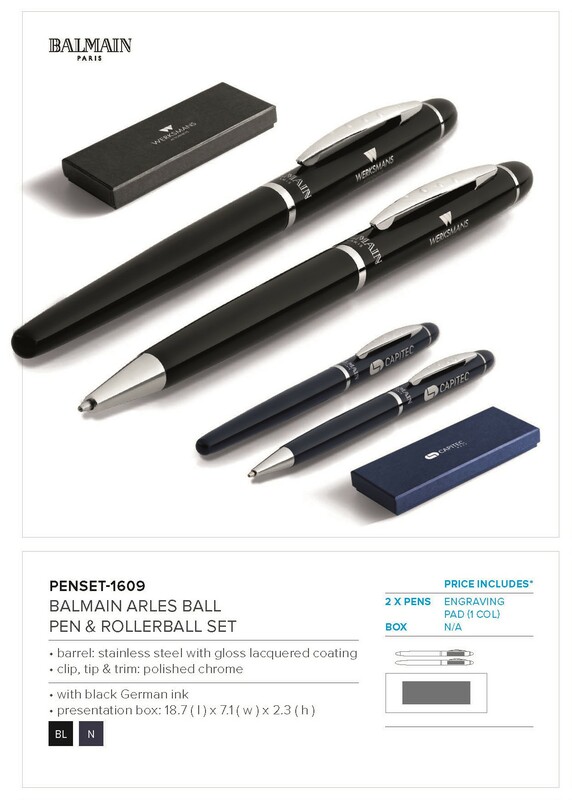 A fantastic gift for important clients and staff members from a world renowned pen brand, this amazing set is elegant and comfortable to hold, giving you a branded gift that can be enjoyed every day by important clients and executive staff members alike. With high-quality black German ink and a great-looking design, this is a popular gift set option. Comfortable to hold and great to show off around the office, these are sure to be loved by every executive client. Don’t miss out on this fantastic Balmain pen set, e-mail info@brandinnovation.co.za now to order yours today.